A body of rock that is brittle—either because it is cold or because of its composition, or both— is likely to break rather than fold when subjected to stress, and the result is fracturing or faulting. 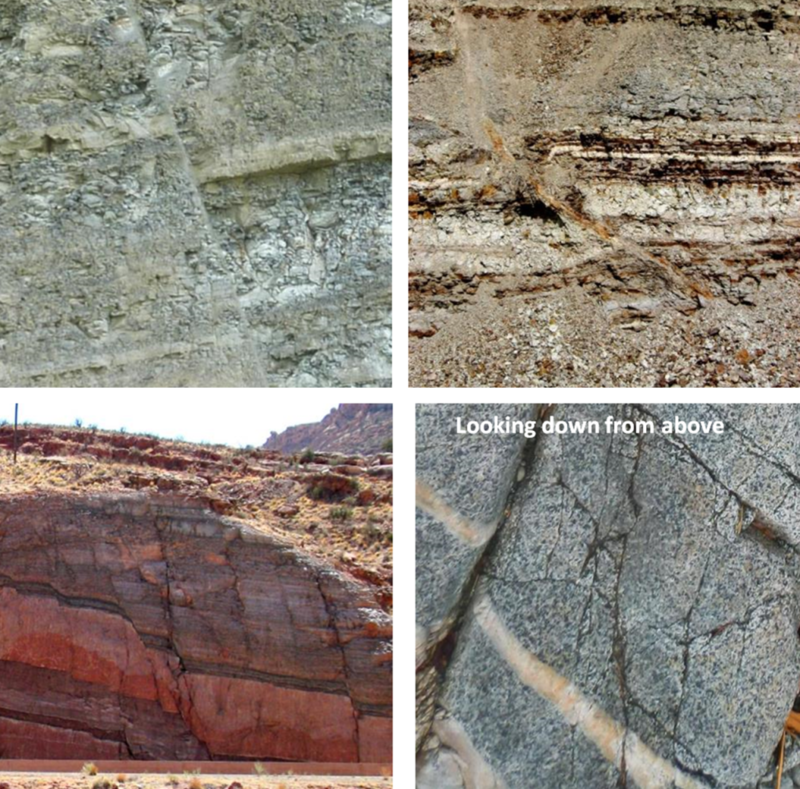 Fracturing is common in rocks near the surface, either in volcanic rocks that have shrunk on cooling (Figure 12.4a), or in other rocks that have been exposed by erosion and have expanded (Figure 12.9). A fracture in a rock is also called a joint. There is no side-to-side movement of the rock on either side of a joint. Most joints form where a body of rock is expanding because of reduced pressure, as shown by the two examples in Figure 12.9, or where the rock itself is contracting but the body of rock remains the same size (the cooling volcanic rock in Figure 12.4a). In all of these cases, the pressure regime is one of tension as opposed to compression. 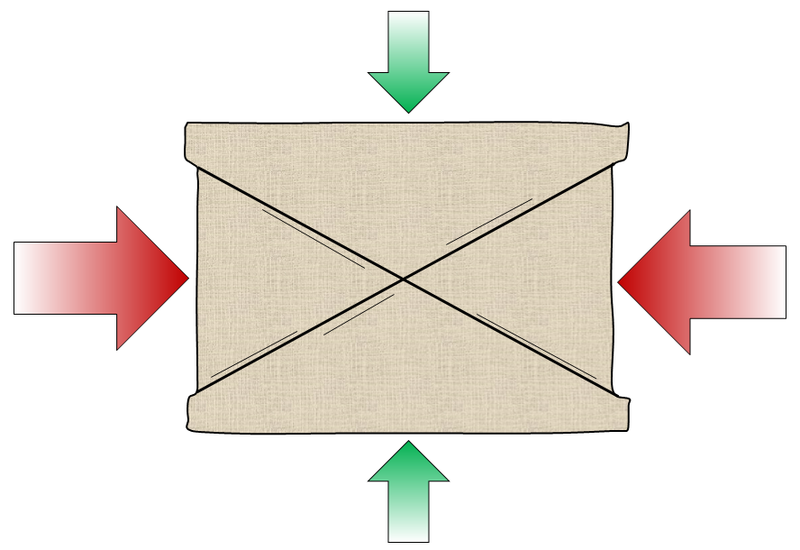 Joints can also develop where rock is being folded because, while folding typically happens during compression, there may be some parts of the fold that are in tension (Figure 12.10). Finally joints can also develop when rock is under compression as shown on Figure 12.11, where there is differential stress on the rock, and joint sets develop at angles to the compression directions. A fault is boundary between two bodies of rock along which there has been relative motion (Figure 12.4d). As we discussed in Chapter 11, an earthquake involves the sliding of one body of rock past another. Earthquakes don’t necessarily happen on existing faults, but once an earthquake takes place a fault will exist in the rock at that location. Some large faults, like the San Andreas Fault in California or the Tintina Fault, which extends from northern B.C. through central Yukon and into Alaska, show evidence of hundreds of kilometres of motion, while others show less than a millimetre. In order to estimate the amount of motion on a fault, we need to find some geological feature that shows up on both sides and has been offset (Figure 12.12). There are several kinds of faults, as illustrated on Figure 12.13, and they develop under different stress conditions. The terms hanging wall and footwall in the diagrams apply to situations where the fault is not vertical. The body of rock above the fault is called the hanging wall, and the body of rock below it is called the footwall. If the fault develops in a situation of compression, then it will be a reverse fault because the compression causes the hanging wall to be pushed up relative to the footwall. If the fault develops in a situation of extension, then it will be a normal fault, because the extension allows the hanging wall to slide down relative to the footwall in response to gravity. The third situation is where the bodies of rock are sliding sideways with respect to each other, as is the case along a transform fault (see Chapter 10). This is known as a strike-slip fault because the displacement is along the “strike” or the length of the fault. On strike-slip faults the motion is typically only horizontal, or with a very small vertical component, and as discussed above the sense of motion can be right lateral (the far side moves to the right), as in Figures 12.12 and 12.13, or it can be left lateral (the far side moves to the left). 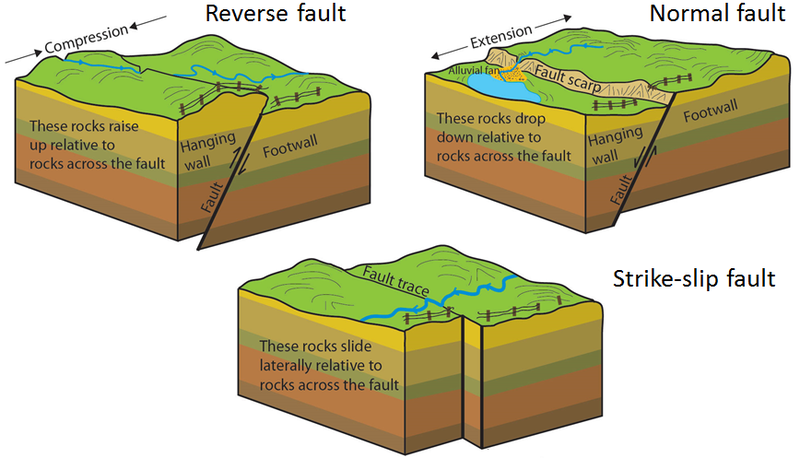 Transform faults are strike-slip faults. In areas that are characterized by extensional tectonics, it is not uncommon for a part of the upper crust to subside with respect to neighbouring parts. This is typical along areas of continental rifting, such as the Great Rift Valley of East Africa or in parts of Iceland, but it is also seen elsewhere. 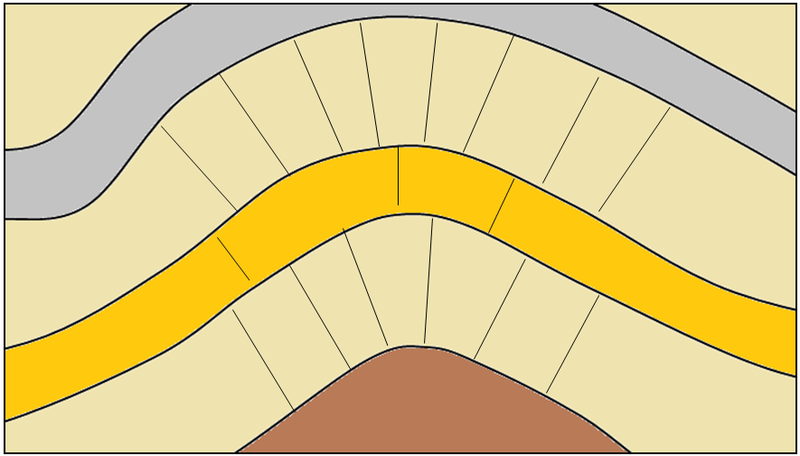 In such situations a down-dropped block is known as a graben (German for ditch), while an adjacent block that doesn’t subside is called a horst (German for heap) (Figure 12.14). There are many horsts and grabens in the Basin and Range area of the western United States, especially in Nevada. Part of the Fraser Valley region of B.C., in the area around Sumas Prairie is a graben. A special type of reverse fault, with a very low-angle fault plane, is known as a thrust fault. Thrust faults are relatively common in areas where fold-belt mountains have been created during continent-continent collision. Some represent tens of kilometres of thrusting, where thick sheets of sedimentary rock have been pushed up and over top of other rock (Figure 12.15). There are numerous thrust faults in the Rocky Mountains, and a well-known example is the McConnell Thrust, along which a sequence of sedimentary rocks about 800 m thick has been pushed for about 40 km from west to east (Figure 12.16). The thrusted rocks range in age from Cambrian to Cretaceous, so in the area around Mt. Yamnuska Cambrian-aged rock (around 500 Ma) has been thrust over, and now lies on top of Cretaceous-aged rock (around 75 Ma) (Figure 12.17). 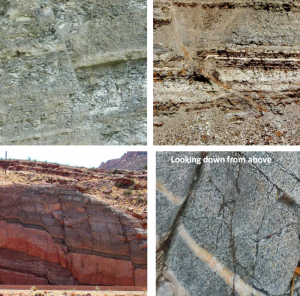 The four images are faults that formed in different tectonic settings. Identifying the type of fault allows us to determine if the body of rock was under compression or extension at the time of faulting. Complete the table below the images, identifying the types of faults (normal or reversed) and whether each one formed under compression or extension. 12.3 Fracturing and Faulting by Steven Earle is licensed under a Creative Commons Attribution 4.0 International License, except where otherwise noted.